My father & I fight. A lot. About everything. My father & I don't, won't, can't talk about anything. Does he even know me? My father & I like to go spelunking. My father & I love each other. Things are good. A fun & fabulous family-style dinner for young women (high school to mid-twenties) with guest speakers Greg Strannigan & his daughters sharing about dads (how we should talk to them without fighting, crying…), being women (uncovering what the Bible says about unrealistic expectations) and God the Father. 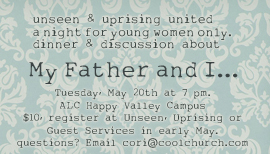 Tuesday, May 20th at 7pm at the Abundant Life Church Happy Valley Campus. Cost is $10. Sign up during Unseen (Wednesday nights at Happy Valley Campus at 6:30pm) on May 7th and 14th, Uprising (Saturday nights at the Parkrose Campus at 6pm ) on May 3rd and 10th or at Guest Services (at the Happy Valley Campus) the first two weekends of May. Space is limited; so don’t delay! Email cori@coolchurch.com with any questions! I hear that Greg guy is a pretty good speaker . . .
Dlmayfield.wordpress.com on so there media week! Krispindanielle.wordpress.com on lots of links... who did I miss?